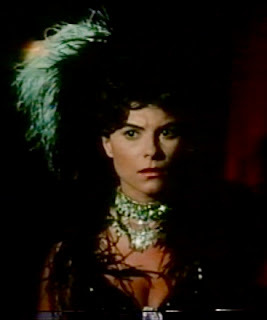 As Daisy White she's helped Paul Michael Glaser beat back the blues in The Great Houdinis ("Come to bed, Harry"), and now the 14th annual New York City Horror Film Festival will celebrate the career of Adrienne Barbeau this Saturday, November 12, with a Lifetime Achievement Award. Of course, horror fans recognize her as the star of The Fog, Escape from New York, Swamp Thing and other films. But she'll always be Daisy to us! So far she is the only actress to have played the real-life temptress. For more information on the New York New York City Horror Film Festival visit the official website. UPDATE: You can read a report on the event at Geeks of Doom. Escape From New York was on cable yesterday. The Fog--John Carpenter's original version, not that CGI remake abomination--is one of my all time favorite horror films. Adrienne was great as the radio station owner on the coastline. She also played Maude's daughter in that 1970s sitcom spinoff of All in the Family. I also love The Fog. And I watched Maude as a kid. She did Grease on Broadway? I didn't know that.